The first recorded triathlon was in California on September 24, 1974. It was organised by the San Diego Track and Field Club at Mission Bay and was created as an alternative to the rigors of athletic training on the track. Since this, Triathlon has developed into one of the fastest growing sports in the world, and one that can be enjoyed by all ages and abilities. Triathlon is an activity that combines swimming, cycling, and running in one event. The Olympic, or “standard” distance in triathlon is a 1500 metre swim, 40 kilometre bike, and 10 kilometre run. Triathlons can be completed as an individual event, or a team event. Triathlons are organised through independent event organisers, provincial triathlon associations and clubs. They are run at local, provincial, national and international levels. 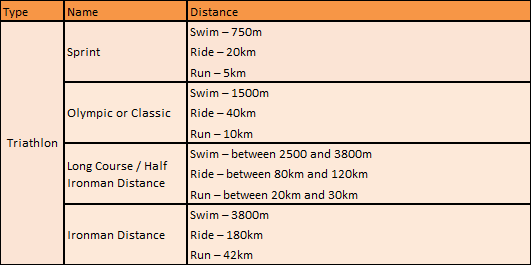 Triathlon events in South Africa range from sprint events right through to ITU World Championship races. A goal of TSA/CTUTA is to create welcoming entry points for people of all ages and abilities, providing lifelong participation in the sport of triathlon. Whether your goal is to complete your first Sprint or Olympic distance triathlon, participate in provincial or national championships, or to gain selection for the Age Group World Championship team, triathlon is a sport which provides the pathways between participation and high performance in a way which enables all individuals to achieve whatever level they aspire to. • Enter as a member of a two or three person team. This can be a great way to try out the sport with your friends, and get to know the three disciplines of a triathlon. • Join a triathlon club. Triathlon clubs are a great way to meet other triathletes and coaches, get involved in a regular training programme, or sign up for a skills development course. Clubs will often keep their members updated on local or provincial races and events, and provide a great social aspect to the sport. The swim will take place in a swimming pool or open water, such as a dam or the sea, and if you’re taking part in an open water event you will need a wetsuit. Club MSM swims every Saturday morning in Small Bay at Ons Huisie 08h00. (Announcements are made on the clubs WhatsApp group). The swim start will be in waves, with times based on your predicted swim time or age. You can do either front crawl or breast stroke in the event, whichever you prefer. Helmets are compulsory for all races; even the elite stars wear them. A bike is an essential bit of kit, but as long as it's been serviced and road worthy you can use it. Most races are on roads open to other traffic. If you're nervous or new to cycling, it would be useful to practice riding your bike on quiet roads until you have built up your confidence. The bike route on your race will be signposted and have officials to help direct you. However, it's always useful to check the competitor information to check the route before the race. Shoes are the most important part of your running equipment, and it is worth making sure your trainers fit and are comfortable. Running after the bike can be a little different, but don't panic; it will get easier as you continue to run. There are usually drinks stations on the run route, and again the route will be signposted and have officials. If you need to improve your running your Club MSM will have sessions and coaching available. This is often called the fourth discipline in triathlon for those at the top of the sport. However for many people transition is simply where all your swim-to-bike and bike-to-run kit is kept during the race. You'll be given a race number which you'll need to wear on the bike and run, and sometimes a timing chip to time you from start to finish. You'll need to rack your bike and layout your kit before the race starts. Your helmet must be fastened before you move your bike and cannot be removed until the bike is racked again. Marshals and a official will be in transition and can answer any questions you might have.